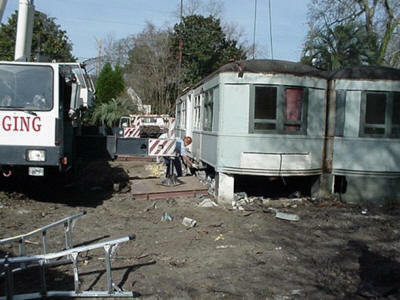 On February 17, 2006, two trolley cars which had been used as a residence since 1938 on Apollo Road in Charleston, SC were moved into a secure warehouse. 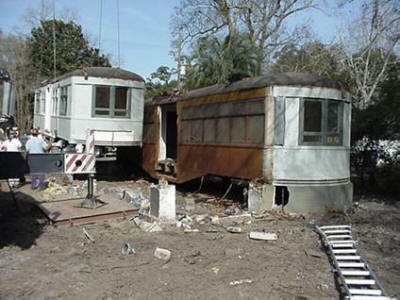 The center door cars had been joined at the hip, and had grown porches on either side and a gable-end roof structure overhead. 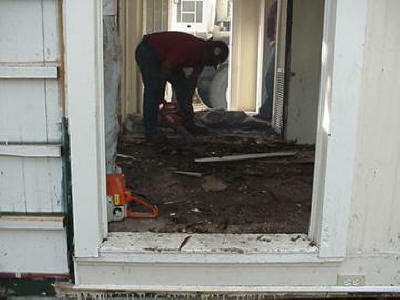 In mid January, a demolition contractor removed the porches and roof structure using a claw on a knuckle boom. He did not take any action to disconnect the structure of the roof from the wooden trolley pole bases and roof walks secured to the cars, and tore large holes in the car roofs in the process. 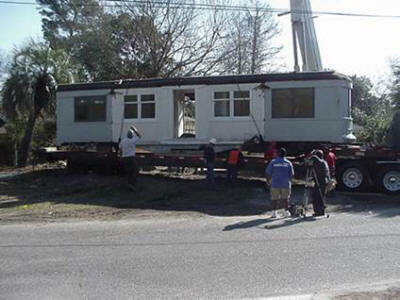 In an effort to prevent more possible damage, I contacted the owners of the cars, Clement, Crawford and Thornhill, a real estate development firm, and offered my technical assistance in carrying out the move. Parker Rigging sets up to lift the first car. 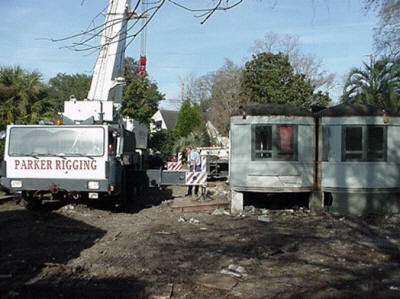 They used one crane so they could swing the load 90 degrees, and set the carbodies down on trucks in the street. All photos by Dave Lathrop. The planned day for the move started with a welcome break in the damp, cloudy weather. Fortunately, there hadn&apos;t been much rain in the previous few days, so the ground wasn&apos;t too saturated, and could bear the weight of the crane. Action Transport, the trucker, showed up with some nice long rollback trailers, and the demolition contractor, who was the GC on the job, provided a few helpers, and some tools and cribbing. Riggers setting slings to lift the first car. It was necessary to have a man on the roof to shove the inner slings down the narrow gap between the cars to another under the cars, with the outer slings in hand. Once both ends were under the car, they were shackled together, and the slack taken up. Some dunnage was set between the corner of the car and the wire rope slings where they would bear the weight. Slack taken up and ready to lift the carbody off its foundation. At this point, the demolition contractors severed the last connection between the cabodies�a floor bridging the gap where the step recesses of both side entrances came together. The job was difficult, as the wood was so full of pitch that it dulled the chainsaw blades very rapidly. Demo dude wearing his way through the bridge. Finally, the cars were separated, and it was time to lift the first car. The first car in the air, swinging gently back from the other. With the first car in the air, it was wonderful to find the original sash still in place on the hidden sides of both cars. The last in service paint appears to be transit safety orange. Note the cut bridging in the step wells, that caused all the trouble. 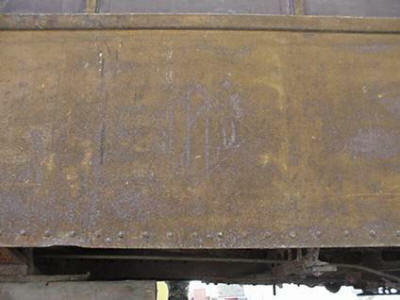 4 original ventilators also remain on the carbodies. The first load out on an Action Transfer truck. 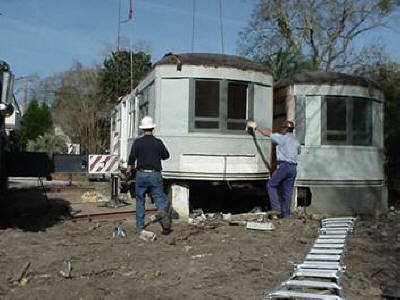 We cribbed under the end to the raised portion of the deck, and under the step framing to the lower portion of the deck to fit the carbody on the length of the trailer. The rear end of the car was cribbed properly to the bolster. Both cars were cribbed the same way, ands traveled without incident. Another great surprise was finding the original number still barely visible on the second car. 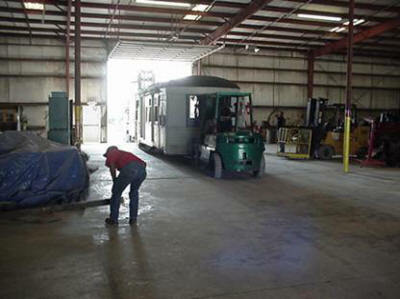 Shown after loading on the second drop deck tiltback trailer. 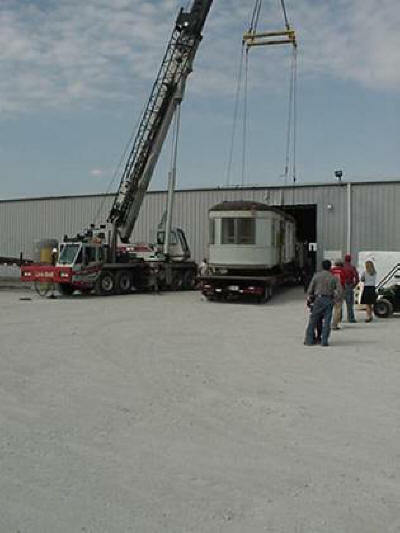 To save time, Parker Rigging sent a second crane to the unload site at Standard Transfer and Storage. 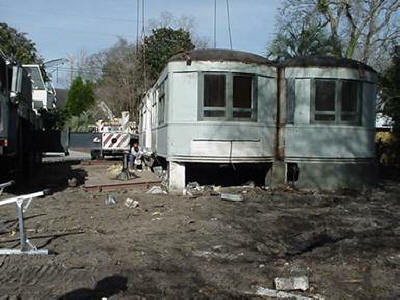 The demo contractor had planned to unload onto skates and roll in on hard concrete. There were insufficient skates, and the carbodies would need to have been cribbed to clear the drop step framing, which would have been unwieldy. 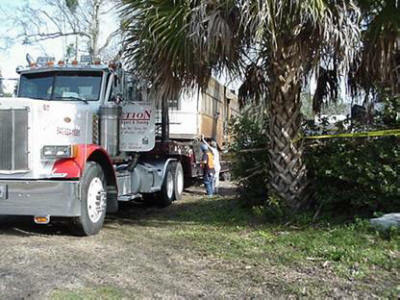 Unfortunately, he also sent his truck with additional cribbing home instead of to the unload site. Standard had one huge forklift, and a smaller one. I was able to move the cars after unloading using both forklifts, one from either end, with the only long cribbing we had crossing as many bits of car frame as possible within the reach of the forks. Combining the short bits of cribbing from the truck with what we found here and there around the warehouse, we were barely able to crib the carbodies high enough to get the forks back out again. Easy does it! The big forklift is pushing from outside. The little forklift is precariously balanced without its steering wheels contacting the floor. We had to aim carefully, but we got the job done without delaying the rigger. 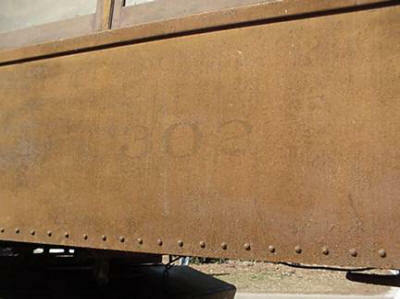 The ghost of the diamond SEPCO logo on the "mystery car" was visible briefly when that side of the car was facing the sunlight during the unloading. Unfortunately, the car number was not legible at the other end. Hopefully, it will be found under paint on the interior. OK, I&apos;d ideally like to have had more cribbing, but that can be beefed up anytime. Tucked in snug at last. The cars have been preserved by CC&T, who do some interesting adaptive reuses, such as converting an old hospital into an office building. Just what the future may hold for these unusual carbodies isn&apos;t completely clear at present�rest assured, when I find out more, I will pass along the information. The Historic Charleston Foundation is also involved in the preservation, and no doubt would like to have them restored someday as accurately as is reasonably possible. 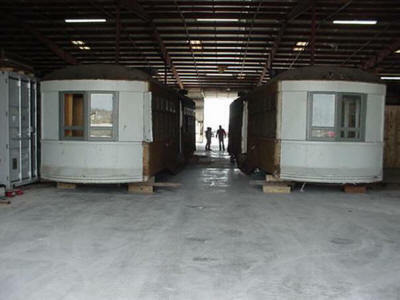 Both carbodies are in essentially good structural condition, and are restorable either as static displays or as operating cars should that ever be desired. The extent of damage inflicted by their conversion into a residence, and the subsequent deconstruction, is primarily in wooden floor and roof fabric, and the majority of that damage is localized and repairable. 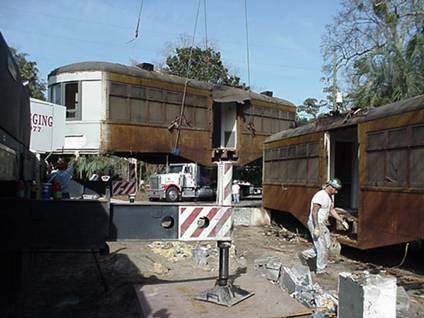 If anyone has historic documentary information on the Charleston streetcar lines, and in this series of cars in particular, and is willing to share, I would be pleased to arrange for copies to be passed along to the new owners.